Everyone likes to pick apart the language of politicians, but it’s the job of linguists to pick apart everybody’s language, from the everyday to the very rare, from the learned and refined to the rough and tumble, from the main streets and gated communities to the empty lots and back alleys. We come up with stunning insights about language for a living, and so far as analyzing political language, well, you could say we eat it for breakfast. But the age of fake news, Fox News, and Trump™—all of them synonymous to some extent—is challenging our long-held beliefs about how language works. You might think that language is all about communication, but decades ago Noam Chomsky debunked that myth by citing two things he wrote knowing that no one would ever read them: his masters thesis on the morphophonemics of Modern Hebrew and his annual letter to the IRS refusing to pay the portion of his tax bill earmarked for military spending. 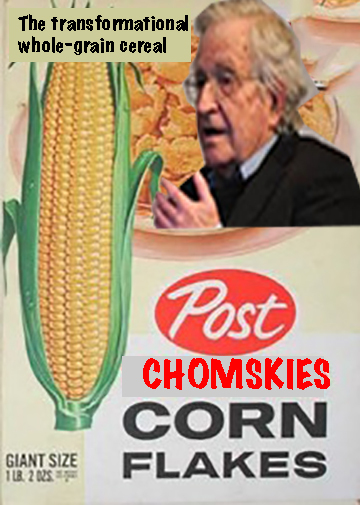 Of course Chomsky communicated this in a talk where he expected his audience to understand his words. But Chomsky could now add Trump Talk™ to his examples, because fake news, Fox News, and Trump™ use words to not communicate. If people actually listened and understood, they would immediately switch channels, assuming they hadn’t already thrown the TV out the window, which would render the question of switching channels moot. And assuming they hadn’t jumped out the window, though there are easier ways to indicate you aren’t listening, like turning off your Facebook, blocking Trump™ on Twitter, and staying away from federal offices, where like the telescreens in 1984, all TVs are tuned to fake news Fox News, all of the time. The language philosopher J. L. Austin showed us that language is all about doing work. In his theory of speech acts, Austin explained how language can be used to alter reality: a minister says a few words, and two people who were single before the words were uttered are married afterwards. Say a few more words in a courtroom and a person who was free is dragged off to jail. With still more words, an anonymous ship gets a name, or a genie turns you into a malted. Austin presented his theory in a series of lectures called “How to do things with Words,” and to prove that words do things to other people, some members of the audience promptly fell asleep. Another linguist, H. P. Grice, discovered what he called the cooperative principle of conversation: the participants in any discussion agree to tell the truth, the whole truth, and nothing but the truth, clearly and with an economy of words. Grice explained this at length in a series of articles and a 400-page book. Of course, those were monologues, not conversations. But Austin and Grice never watched Fox News. The Age of fake news, Fox News, and Trump™ is causing us to rethink everything we know about how language works. For example, Grice’s “maxim of relevance" states that the participants in a conversation make their contributions relevant. But Grice 2.0 operates under a maximum of irrelevance: when a major story breaks, a Fox News panel ignores it and talks about the emails. Similarly, Grice’s “cooperative principle" has to be revised: Fox News pundits ignore the truth, the whole truth, and everything to do with the truth, and they do so obscurely and with far too many words. But they are not completely unrestrained; they stop regularly for commercial breaks. Because capitalism. As for Austin, he pointed out that promises and threats are speech acts, and that the only difference between the two is, you don’t want to be on the receiving end of a threat. But in the age of Trump™ it has become exceedingly difficult to tell the difference between a presidential promise and a threat, and you certainly don’t want to be on the receiving end of either one. Fortunately, Trump’s™ speech acts seem to do very little work, which is what happens to your language if you play golf all the time. Then there’s the great language scholar Max Weinreich, who famously defined a language as a dialect with an army and a navy. But like Austin and Grice, Weinreich never knew Fox News. In the present age of linguistic demagoguery, he would say, “The language of Fox News is Breitbart’s dialect with better hairdressers, deeper pockets, and more viewers." In “Politics and the English Language,” George Orwell attacked politicians who evaded blame for their mistakes by hiding behind the passive voice, and he scorned words that are opaque and misleading. But Orwell used the passive voice to complain that "the passive voice is wherever possible used in preference to the active," and he did so under an opaque and misleading pseudonym (his real name was Eric Blair). Orwell also stole his recommendations for the simple and direct language that he wanted everyone to use from Henry Fowler, who came up with the same formula forty years earlier. But all that doublespeak didn’t keep Orwell from getting high marks on Goodreads. What about Orwell in the Age of fake news, Fox News, and Trump™? The man who brought us doublethink and the thought police would simply claim to have invented the term fake news, although it has been in use for more than a century, and its precursor, false news, goes back hundreds of years. Finally, the Swiss linguist Ferdinand de Saussure separated language into a two-part structure consisting of langue, the abstract, general knowledge we have about the language that we speak, and parole, the words we actually say when we put that knowledge into practice. Our langue, our inner understanding of speech, is ideal. But our parole is by definition imperfect, full of hesitations, backtrackings, variations, ums and ers, and just plain mis-statements. De Saussure would surely recast his theory of dual language structure in the Age of Trump™, or as he might call it, l’Age de la Trompe. Since trompe in French means both ‘trumpet’ and ‘deceive,’ de Saussure would say that the language of fake news, Fox News, and Trump™ consists of an endless stream of loud deception. You don’t have to be a linguist to know that is far from ideal. Yes, you have some valid specs about Trump speech. Aristotle stills speaks the loudest to me. He codified the enthymeme system in Classical Greece, as you know. The Trump strategy is enthymemic. If there is Trouble in River City (I was just writing an essay about that) then hammer away at the list of woes and keep asking who is in charge? Evil Chicago? Think, children, who is in charge? Those who are attuned to rhetoric will now hear the loud chirping of crikets when it comes to trouble in US cities and towns because the managment has changed. Perhaps Chicago, the home of all that is enthymatically evil, will still be snarled on occasion, but in ever so many places peace, joy, and harmony now reign and no public discourse is needed to magnify that state of perfection around the country. The rhetoric of omission is still operational. As Mr. Trump becomes more and more frustrated with having to comply with the law, his language becomes Fowler. What do you call a retired professor? NPR Poll: Americans don’t want to be politically correct. Tote bag, anyone?